The first feature film by George Lucas is interesting more for spotting the genesis of ideas that would later emerge in the Star Wars series, and less for the film itself. Holograms, robotic soldiers (in this case police officers), androids, and fights with long sticks all make their debut in THX 1138. The film itself barely conceals its student project origins, and has strong parallels with 1984. In a seemingly highly repressive futuristic society that generally remains unexplained, the population is controlled into robotic submission by mind-altering drugs, and all actions are centrally observed and controlled. People have numbers instead of names. 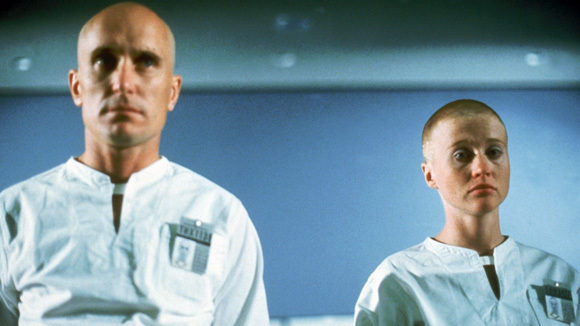 THX 1138 (Robert Duvall) is an android builder, and he's not following orders in taking the prescribed pills. He starts to experience emotions and enters into an illicit sexual relationship with his roommate LUH 3417 (Maggie McOmie), and they are observed by SEN 5241 (Donald Pleasence). Soon THX and LUH are captured but so is SEN. After spending some time as captives, the three must face their destiny. The film mixes a technology-heavy focus with a sparse, almost theatrical look, dominated by white clothes on plain white canvas. Not much time or effort is invested in providing any kind of background or depth to the proceeding, so THX 1138 becomes solely focused on the characters and their immediate actions with little context. Duvall barely conveys emotion, Pleasence is over-emotive, and McOmie alternates between grim desperation and embracing the fleeting freedom from drugs. The film's aloofness translates into a cold viewing experience. With little emotional ties to THX 1138 the character or the film, the final, prolonged sequence fails to engage. The directorial debut of George Lucas is more intellectually interesting than triumphant, but it was a likely necessary passageway to one of the greatest science fiction film franchises.